Those were the words that gave the Rev. Bevon H. White his motivation to enter into Ministry some 25 years ago. 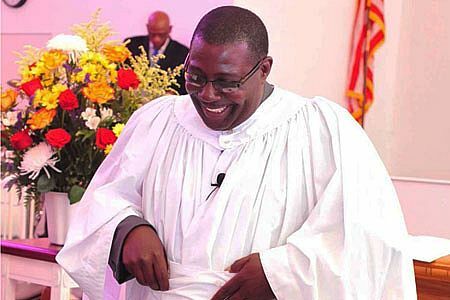 In September, Bevon, a native of the Jamaica & Cayman Islands Province, was installed as the Pastor for Faith Moravian Church of the Nation’s Capital. He received his MATS degree from Moravian Theological Seminary last spring. The weather was perfect, the congregation excited, and before some 250 people, Bevon and his family were received into membership, and Rev. White later installed as Pastor. Sis. Peg Grenier, Penn-Mar representative for the Eastern District Executive Board officiated on behalf of Rev. David Bennett. Also in attendance were representatives from area congregations and staff from the Jamaican Embassy in Washington. During the installation service, Bevon preached a sermon entitled "The Ministry That Matters." In it, he outlined what ministry means to him. "In our text, we are reminded of God’s initial choice in our lives. We respond to God’s choice with our own choice. Not only are we chosen, but we are also appointed. Appointment is not a force of action, but leaves us a choice to act accordingly. I see this installation today therefore as a fulfillment of what God had already planned out, with each of us having a role to play in the ministry of the church, making it a ministry that matters. "I share three things about this ministry. First, it is an Ordained Ministry. Ordained speaks of being religiously appointed, it is to be set apart for service; it is the authority by which we do ministry. We recognize the ministry of those who are Ordained in our church and in other churches, but we also recognize the ministry of the church as being ordained by God, and all of us as Christians are called to do our part in this ministry as defined by each congregation. Each of us therefore is called by Christ to be part of the ministry of the church. We refer to this as the Priesthood of all Believers. "Because ministry is a command, we should be concerned with obeying, and leave the results to God, difficult as this can be in this results driven society. Be prepared therefore, as we minister together, to embrace entirely new avenues of ministry, to try new ways of doing old things, and to apply old ways to new things. ‘Behold I make all things new’ still applies to the church today. "And third, it is a ministry that is Authenticated. We do not do ministry at our whim and fancy, neither do we do ministry as a hobby. Church is not a social club, a get-away, or a meeting place for friends. The church’s ministry is genuine, it presents truth and is a legitimate representation of God’s outstretched arms to this world in which we live. As such it is a ministry that is given the full backing and support of the wider body, but more-so, of the God we represent, the one who directs the ministry. "Finally, friends, a word of caution. In this ministry to which we have been called, there is accountability to boards, committees, church, but ultimately, to God. Because we are answerable, it behooves us to act responsibly in this ministry. This friends, is our opportunity; this friends is our time to minister in a way that matters—that matters to the lives of those we touch; that which matters to our church’s future as well as ours. It is the opportunity to answer God’s call to an ordained, commanded, and authentic ministry. We have been chosen for this place, time and task. As I have responded, so I encourage us all to respond today, "I will go Lord, if you lead me, I will hold your people in my heart." Rev. White called on the congregation to rise up and increase their impact in the surrounding community. He committed to working closely with the congregation to strengthen ministries and increase the church’s membership and influence in the community. He stated, "The idea is to get everyone involved in the church’s ministry. Among the adults there will be various ministries to incorporate every member of the church. There is much to be done and together, we have an opportunity to do ministry in a new way."